The Chesapeake Sailing Yacht Symposium, begun in 1974, has continually set the standard as the premier forum for presenting sailing yacht design technical information. Sponsored by the Society of Naval Architects and Marine Engineers (SNAME), U.S. Sailing, the Chesapeake Bay Yacht Racing Association, and the Naval Academy Sailing Squadron, the CSYS brings together the designers, builders and sailmakers of sailing yachts, and the many yachtsmen who enjoy the pleasures of racing or cruising. 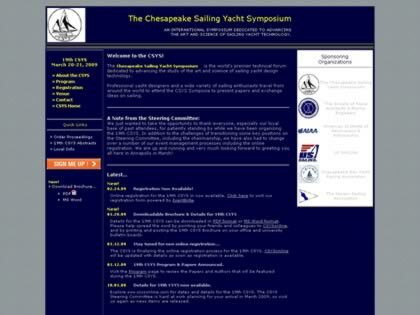 Web Site Snapshot: If available, above is a snapshot of the Chesapeake Sailing Yacht Symposium web site at http://www.csysonline.com as it appeared when this site was added to the directory or last verified. Please Note that Boat Design Net has no involvement with the above web site; all content and images depicted in the above thumbnail are the property and copyright of Chesapeake Sailing Yacht Symposium unless otherwise noted on that site. Description: The Chesapeake Sailing Yacht Symposium, begun in 1974, has continually set the standard as the premier forum for presenting sailing yacht design technical information. Sponsored by the Society of Naval Architects and Marine Engineers (SNAME), U.S. Sailing, the Chesapeake Bay Yacht Racing Association, and the Naval Academy Sailing Squadron, the CSYS brings together the designers, builders and sailmakers of sailing yachts, and the many yachtsmen who enjoy the pleasures of racing or cruising.